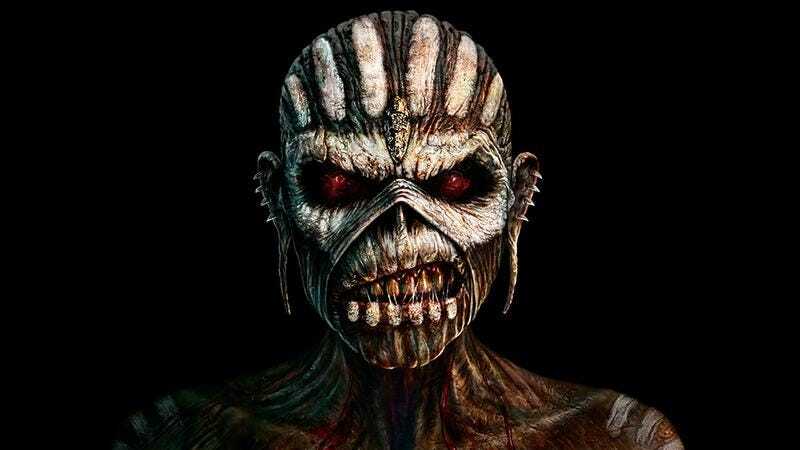 Earlier this year, Iron Maiden frontman Bruce Dickinson revealed that he had been undergoing treatments for tongue cancer, and in May, Rolling Stone reported that his doctors had given him the “all clear.” Now, to celebrate, Iron Maiden has formally announced a new studio album. Titled The Book Of Souls, the album apparently features the longest song Iron Maiden has ever recorded, an 18-minute epic called “The Empire Of The Clouds.” The Book Of Souls also features a song called “Tears Of A Clown,” which Rolling Stone helpfully assures its readers is “not a Smokey Robinson &The Miracles cover.” Iron Maiden doesn’t have any tour dates scheduled to promote The Book Of Souls yet, due to Dickinson still recovering from his cancer treatment, but the band expects to be on the road next year. The album is set to be in stores on September 4, and you can see the full album art—which, of course, features Eddie, the band’s zombie mascot guy—and the track list, below.